We are MAGGIE Award Finalists! Ivy & Ink designed a publication currently in the running for one of the most prestigious awards in the publishing industry! The Western Publishing Association (WPA) annually recognizes publications of excellence in over 100 categories and we’re finalists in the “Guides, Catalogues and Directories/Trade & Consumer” category. We felt like winners when the guide was hot off the press and we are thrilled to be announced as finalists among top-tier publications from 24 states west of the Mississippi. Due credit and acknowledgement goes to Gibbons Media (our client and the publisher!) who hired Ivy & Ink for this project, was integral to the vision and production of this first-rate guide, and who proudly submitted the guide for consideration! Let's hope for publishing honors as one of “the Best in the West”! I’ve been invited to speak on a graphic design panel for a high school career day. Most high schoolers are not sure what they want to do with the rest of their lives—I wasn’t then, and I’m still not. I’ll be there to answer specific questions about the design field but I’m hoping to offer insight that can be applied to any career, because as we all come to find out, things change. We can't possibly be prepared for every situation. I hope these vignettes from my own experiences will serve those that are just starting out. Find a job, any job,* no matter what. If you go on to higher learning, search for job opportunities before classes start–*preferably a position on campus. I accepted a university job which was offered during registration. With two options to choose between, food service and maintenance, I decided to go with the latter. It wasn’t glamorous, but it set me up from the get-go. I was allowed to arrive before general move-in day which helped me get acquainted with my surroundings (and I met one of my best college friends!). Most importantly, I was able to select shifts that fit between my class schedule, keeping my days reasonably full but not long. And I had a stream of income—measly for sure, but above minimum wage with quarterly raises! I cleaned my dorm building for the first two years of college, even after I had moved off campus by sophomore year. This job had nothing to do with design or art but it taught me discipline, time management, and prioritization of schoolwork. Come summertime, I was already on the short list for maintenance jobs on campus and I didn't have to scramble for the short-supply of retail positions that the entire student body was applying for after final exams. And I had a school-affiliated job on my resume. As you build experience, be open to opportunities that deviate from the job descriptions you’re familiar with and avoid making assumptions about your field of interest. I was on track for a graphic design BFA, with a Business Minor. I continuously sought "Graphic Design" positions posted in the art department to no avail and often disregarded the postings at the business school. However, I came across an internship at the business school looking for skills beyond the usual scope–one of which was graphic design. On a whim, and with little expectation, I interviewed for a Product Development job. I got it! I moved to Chicago for a summer, toned my graphic design muscles and learned about an entirely new facet of the industry. Work for someone else before you start on your own. No matter how talented and resourceful you are in your craft, there's always more to a job than you think. In the graphic design field, many professionals decide to start their own small firm, or as some solopreneurs call it, freelance. When I first moved to LA, I worked at a publishing firm in Santa Monica for close to 4 years. I advanced from a part-time junior designer to art director. "Climbing the ladder" helped me lead the designers who were now fulfilling my earlier responsibilities. As department head, I was thrown into a lot of situations where I was the decision maker so I had to learn as I went. Even with all my formal training, 80% of my job was new to me. At an agency, I had the support of real-world professionals and insider access to invaluable industry processes. I was propelled forward in my career. Priceless information, a solid list of contacts, and indispensable mentors help me successfully run Ivy & Ink today. Don't let others define your success. I left my well-paying, steady paycheck as an art director because that decision was right for me. I could have climbed my career ladder higher—advancing to a bigger company with added responsibility and a higher salary—but I found that the fast-paced agency environment was burning me out. Seventy-hour weeks and giving up weekends to push through deadlines was no longer exhilarating. In my late 20s, I wanted to be cultivating friendships and fulfilling my own artistic needs. I wanted all my career decisions and priorities to be up to me…and get ALL the credit when I achieved something great. My superiors and mentors were now my peers and the only person left to prove my talents to was myself. Going out on your own is hard, and even alien at first, but it can be immensely fulfilling. It’s been 2 years since I founded Ivy & Ink and I’m a happier, way healthier, yoga practicing, book reading, award-winning illustrator, and more successful designer for it. An employer no longer matches my 401k, I don't feel like a hot-shot who flies to Las Vegas on the company dime for press-checks, and I miss flipping through a freshly printed sample surrounded by my colleagues. Being a business owner is hard work and it's not always glamorous. The reassurance that you're happy with what you've created should be reward enough, no matter what fellow designers think success should look like. I’ve made a lot of pivotal decisions, good and bad, but looking back, these stand out to me as some of the good ones that brought me to where I am today. My resume now reflects what always seemed unattainable, the status of a seasoned designer with enough “experience points” to stand out. I’d love to hear some of the best decisions you’ve made for your career in the comments below! A logo is one of the most vital assets of a client’s business identity. As part of visual branding, it is one of the first marketing tools a start-up commissions and almost always the first thing prospective customers see, interpret and relate to. In the advertising, marketing, and design world (and pretty much everywhere) first impressions are everything. Just like a good handshake or a friendly smile, a notable icon or logotype that conveys the appropriate message is what sets our clients apart from the competition—capturing their target audience’s attention and loyalty. According to Forbes.com, about 543,000 new small businesses are started each month in the US, so it comes as no surprise that competition is fierce and start-ups must differentiate themselves. What isn’t surprising is that many of these start-ups fall short with logos and branding that are disconnected from their brand mission and target audience. When a logo is visually captivating, add one point to the "good logo design" scoreboard, but objectively, that doesn’t always mean it’s effective. A successful logo tells a story in the appropriate brand voice while also being memorable, scalable and effective without color. Our studio approaches brand strategy and identity design thoughtfully, setting us apart from the multitude of “logo mills” available online. As an established design studio, we devote most of a project’s time to ideation and concept exploration in the design process, as should any professional designer or firm. With extensive preliminary work, we sketch between 20-40 concepts before honing in on the most compelling and appropriate 3-5 concept directions for our client to review. Collaborating with a studio that creates a brilliant foundation for a client’s brand, product and ideal customer should take precedence above following trends, or worse, bidding for unoriginal designs that boast a cheap price tag (not so cheap when your competition has the same one!). In creating truly effective logo designs, we delve far deeper, beyond visual cliché’s, formulating concepts that inform and captivate. Dual meaning, or even three simultaneous meanings, in a logo creates intrigue, compelling our client’s audience to create personal brand associations rather than patronizing them with tired and overly-literal brand imagery. In a sea full of print and digital media, you want to delight your audience with a unique logo but avoid confusing them with a misaligned one. Our studio creates one-of-a-kind, timeless logos that are as effective as they are striking, setting our clients up for distinction and a progressive identity to compliment their company's brand. Ivy & Ink works closely with businesses, individuals and couples to create exceptional monograms that represent one’s company branding, unique style or symbol of unified love. Our studio recently created a dual monogram (pictured) for a soon-to-be-wed couple with the same first and last initials as well as mirrored middle initials, M and W. What a fun challenge! After some initial concepts based on the couple's preferences we designed a contemporary, Art Deco-inspired monogram, which effortlessly symbolizes the couple's love and newly unified identity through marriage. This monogram will be used to add special customization to their wedding stationery and will also remain an icon of their shared identity throughout life. Ivy & Ink is seasoned in designing custom logos and personal or professional monograms. Send us an email if you are interested in having us design one for your business, a loved one, or as a truly thoughtful gift (maybe for a bride-to-be)! Ivy & Ink’s new business cards have been making the rounds in Southern California and they feature an awesome new print technology know as Akuafoil or ElectraFoil. We’re very excited about it and want to share it with you! The technique features an inline 4-color process printing that can apply infinite CMYK colors over a foil mask. It's a cost-effective and unique way for business cards to shine (literally), as well as a great alternative to Cold Press foils. You no longer have to keep your foil effects to one color or pay a premium for multiple color set-ups. Have you used this technology for your designs? We’d love to see it! Tweet us @IvyInkTweets or share it with us on Facebook.com/ivyandink. Everyone, including the studio cat, loves the illustrated map on VHB's new tote bags! Ivy & Ink was hired to illustrate the map for Visit Huntington Beach's promotional tote bag, featuring all the fun points of interest and activities you can enjoy in Surf City USA®. We just received the finished product and it looks great! Even the studio cat couldn't overcome her curiosity during a quick product photography session. Ivy & Ink is very excited to announce the launch of the website WorkWithCT.com, designed for Christine Thomas, owner of Work With CT—a business specializing in project management, writing, editing, proofreading and more. If you need help tackling your Administrivia*, look no further than Work With CT. You'll enjoy Christine Thomas' wit and expertise as much as we did during the website development process. *ADMINISTRIVIA—n. The tiresome but essential details that must be taken care of and the tasks that must be performed in running an organization. Ivy & Ink is featured on Greeting Card Universe's Design Spotlight! Thanks for the shoutout, this greeting card is one of our faves! Check out the feature here. On location in Santa Monica for Million Maps cover shoot. Final cover sneak preview! Ivy & Ink was up at the crack of dawn to help capture the perfect moment during the Million Maps Santa Monica cover shoot. Creating an image that embodies the Santa Monica spirit through an active lifestyle, sunny skies, and the iconic Santa Monica Pier was a welcome challenge. 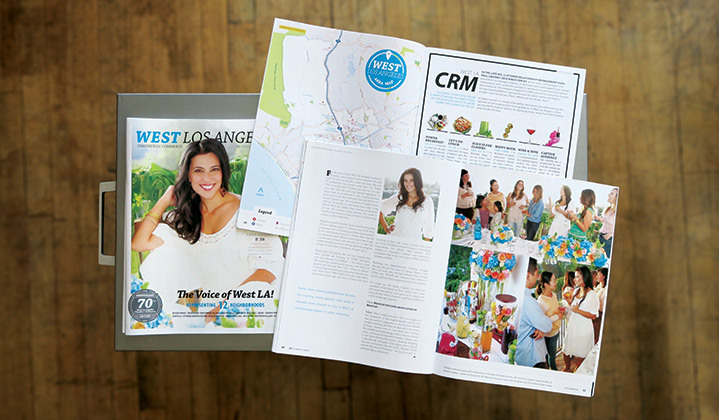 Thanks to the brilliant vision of Million Maps publisher Matthew Gibbons of Gibbons Media, Inc., the good looks of surf instructor Kristin Casillas, the photography of Brandon Wise, and our studio’s art direction, there were tons of beautiful images to choose from. The official cover is making its rounds in the community as we speak! We can’t wait to share this map with ONE MILLION visitors to Santa Monica (in 9 languages!) when we go to press in early 2014. Be sure to look for it on the racks if you're on the West coast and let Ivy & Ink know what you think! You can tweet us at @IvyInkTweets or like it on Facebook.com/ivyandink!